The Raffaello is an excellent three-star hotel in a hidden historic corner of central Rome. Efficiently and considerately-run, it offers comfortable, quiet surroundings and unusually good breakfasts. The location is conveniently close to the Colosseum and the Teatro dell'Opera, and a ten-minute walk from Stazione Termini. 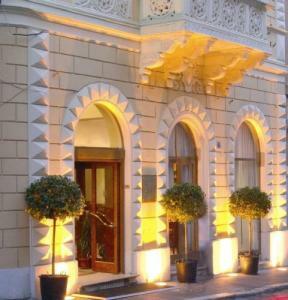 Using our online reservation links, we had booked a twin room at the Raffaello for a four-night break in December. We arrive with the minimum of fuss on the airport bus from Ciampino to Stazione Termini. Usually the convenience of staying within walking distance of the railway station is offset by unromantic surroundings. But after a ten-minute walk down busy Via Cavour we duck through to the little historic street that is home to our hotel and we are in a very different world. Monti, as this rione or district of Rome is called, is an ancient enclave which somehow survives with its medieval charm inbetween the grand thoroughfares of nineteenth and twentieth-century Rome. Armed with a map, we find the hotel easily, and we are checked in smoothly by a friendly receptionist with good English. With one of those odd quirks that regular travellers in Italy will be used to, the little lift stops not on our floor, but between floors, meaning a few steps to mount with our suitcases. For the rest of our stay we either take the stairs on foot, or cunningly take the lift to the floor above, meaning we descend - rather than ascend - half a flight to reach our room. The room is very pleasant, and has obviously been decorated very recently. The decorative scheme may be a trifle overpowering, but obviously a lot of care has gone into it, and the overall effect is one of warmth and consideration for visitors. The feeling is reinforced when we discover little chocolates (called 'Raffaello') by our beds, as well as a pen and notepad. Little touches like this, and the generous selection of toiletries and pocket-tissues, are unusual in three-star, or even four-star hotels in Italy. The room wasn't large but it was an adequate size and well-furnished with desk, wardrobe, suitcase stand, chair, television and mini-bar. The only thing missing was a hook for coats - sadly necessary in Rome in December. Our bathroom was kept extremely clean throughout our stay, and all the fittings were new and shiny. The shower looked rather like a device from a spaceship, with various massage options. We loved the location, but first-time visitors to Rome should note that although the Monti area is lovely, you'll find it a fair walk to the Centro Storico or the shopping district around the Spanish Steps. A great many of Rome's archaeological sights and churches are, however, a very short walk away. Don't miss the grand Basilica of Santa Maria Maggiore, or the lovely frescoes in Santa Pudenziana just a few yards away from the Raffaello. The Metro and buses are about 5-8 minutes' walk away, while Termini is 10. Via Nazionale is the nearest shopping street, with lots of good clothes and shoe shops, and it is also handy for catching buses. There is a supermarket on the far side of Santa Maria Maggiore, and another on Via Nazionale. We enjoyed high-street shopping on Via Nazionale (the shoe shops were only too tempting), and searching for gifts in the smart little chocolate and delicacy shops along Via Urbana and Via Leonina. We walked most of the time, even making the long but fascinating hike over Via Nazionale, along Via delle Quattro Fontane and up past the top of the Spanish Steps to the viewpoint of the Pincio above Piazza del Popolo. The hotel was so handily-placed that we were able to fit in a stroll around the Forum and a big pasta lunch before heading off for our afternoon flight. Breakfast, usually the weak point of Italian hotels, was rated by my companion - a connoisseur - as "very nice" and "perhaps the best I've had in Italy". Winning special praise was the scrambled egg and selection of cold meats, but there were also cereals, fruit, rolls, croissants, bread, yoghurts, cheese and cake. My only niggle was the watery sugared fruit 'juice', but there's no denying the hotel knows its market with the otherwise excellent buffet. I'd give this hotel very nearly a 10/10 - perhaps the room could have been bigger and the breakfast juice better, but those are my only quibbles. Staff were always friendly and helpful, and the receptionists spoke good English and were obliging with advice, an extra room-key, looking after luggage etc. Our stay was very enjoyable. Despite our room being near the stairs we hardly heard our fellow-guests, while the little lane outside was very quiet. In fact, the hotel was incredibly peaceful, especially considering how central it was. Breakfast was consistently good, and the little chocolates reappeared in our room three nights out of four. Although this is more expensive than many three-star hotels in Rome, it is more comfortable than many four-stars. We returned in December 2006 to find the standards still just as high, and will probably visit again. Hotel address: Via Urbana 3-5. From Stazione Termini head down Via Cavour (from the Metro take the exit labelled 'Via Cavour'). Continue down the road. After passing the large open piazza leading up to the Basilica of Santa Maria Maggiore on your left, take the first or second right a few yards downhill onto Via Urbana, which runs parallel to Via Cavour. The hotel is right at the start of the street. The nearest Metro stations are Termini (both lines) and Cavour (Linea B). Hotel Raffaello review by Italy Heaven editors.